Contemporary design meets classic London in this newly-renovated period flat situated in the heart of the lively and desirable area of Angel, Islington, N1. This city retreat is just a stone’s throw away from London’s nightlife, theatre and restaurants, and minutes away from London’s best attractions, giving you the perfect base from which to begin your authentic London experience. Clean, comfortable and equipped with all the amenities you need, plus impeccable service, the apartment is ideal for families, leisure or business travellers. This exceptional 2 bedrooms property will ensure your stay is comfortable, convenient and memorable. •	A master bedroom with a king-size bed, comfortable mattress and down pillows and bedding. •	A second bedroom with a single bed- extendable into a double, comfortable mattress and down pillows and bedding. •	A baby crib and high chair can also be offered. •	A bathroom with a bath and shower, fresh towels, a hairdryer and a selection of luxury soaps and shampoos from The Body Shop. •	The dinner table, with chairs and stylish extra stools, means cooking and eating a delicious meal for your family or friends is easy and enjoyable – whether you’re fixing a quick bite before heading out or celebrating with a full course dinner. •	High speed broadband internet/Wi-Fi with 3 backup connections - ensures you stay connected throughout your trip – great news for our business travellers. A courtesy UK mobile phone is also provided for your use during your stay and we have power adaptors and USB charging stations throughout the apartment. •	The entertainment system comes with a 42-inch plasma TV, cable TV, a Blu-Ray and DVD player, an iPod docking station with speakers and a PlayStation PS3 console with a selection of games, keeping you (and especially the kids) occupied on rainy or tired days. •	A handy instruction manual for every detail of your stay, plus a friendly, helpful service from myself (the owner) and my team, who offer great multilingual communication and support. Make the most of everything this exciting city has to offer without compromising on sleep and relaxation. This apartment is located on a substantially quieter block than the rest of this busy area. The bedrooms are at the back of the property, with blackout curtains, double glazed windows and the latest memory foam mattresses, all dressed in luxurious all-year cotton duvets, with 2 pillows per guest. A baby crib and high chair can also be offered. Angel is an eclectic neighbourhood, famous for its nightlife and collection of iconic local pubs, stylish cocktails bars, renowned international restaurants and upmarket, boutique shopping. One of the most in-demand places to live in London, this safe and eco-friendly neighbourhood is also popular with celebrities – Emma Watson, Boris Johnson, James McAvoy, Colin Firth and Lily Allen are all famous faces that have called this vibrant area home in the last few years. Yet despite it’s amazing reputation and convenient Zone 1 location, the area still has a relaxed, trendy atmosphere. Angel is frequented by local Londoners, with fewer tourists, so you can enjoy an authentic London experience with the luxury of being close to London’s attractions if you wish to explore the city. The apartment is extremely close to many restaurants, shops, supermarkets and ATMs. 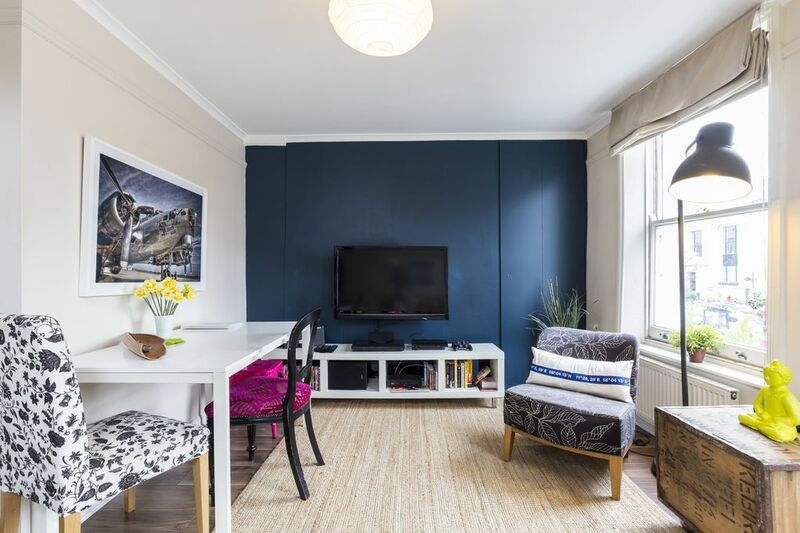 The apartment is located on Upper Street, an extremely accessible location for all of Central London, North, South, East or West and with unbeatable transport links. Angel tube station and Highbury-Islington tube station are both 5 minutes walk away and there is a bus stop right outside the apartment. You can even rent bicycles from automatic stations nearby. There is public (pay and display) parking for your car, should you chose to drive into London. You can park on the street, or a nearby indoor carpark. However, we recommend public transport instead, as it’s far easier and quicker to explore London in this way. Getting to the apartment from the airport is easy using public transport (tube, train or bus) but it’s more economical to hire a private taxi if you have a lot of luggage or many guests. I will give you the information to book this. •	Walk down to the Turkish restaurant next door for a mix-grill or Turkish breakfast; or even a full English breakfast at the Workers Café with some real London people. •	Have brunch at Ottolenghi, the flagship branch of the world-famous restaurant and patisserie. The cosy venue is minutes from the apartment, where you can enjoy incredible French toast, brownies, smoked salmon breakfasts and colourful salads. •	Enjoy a cocktail and fine dining at Hoxley & Porter, or a traditional pint at the Hope & Anchor pub. •	Buy your groceries from one of the exceptional London supermarkets or organic food stores such as Planet Organic, Waitrose or Marks & Spencer’s. •	The Blow Bar is a must-visit if you’re going somewhere special on your London visit. This boutique hair bar will wash, blow dry and style your hair in just 30 minutes. •	Diverse is a beautiful clothing boutique loved by local fashionistas where you can buy the latest chic pieces from Diane von Furstenberg, Marc by Marc Jacobs, Isabel Marant and See by Chloe. •	See a live gig at Union Chapel, a beautiful Grade II listed church that has been converted into an unbeatable live music venue. •	Family-friendly attractions in the area include the Geffrye Museum and it’s splendid Kid’s Zone, the V&A Museum of Childhood, London Zoo and an abundance of parks and outdoor spaces such as Highbury Fields, Victoria Park, Regent’s Park and London Fields. The cafes in the area also welcome families. •	Other places to visit nearby include the Dickens Museum, Camden Market, St Paul’s Cathedral, The Crystal Maze, Emirates Stadium, Spitalfields Market, Brick Lane and much more. You can see the location map here on the website, with the precise location. The full address will be sent to you with your booking information, along with all contacts, arrival instructions, and apartment guide and detailed transport information. The apartment consists of a 1st floor of a renovated period building, accessed by stairs. Entry is via an intercom with buzzer for security, all doors have two locks. It can be rented for short stays from 2-3 nights, with discounts for stays of 6 nights or more. This discount increases for 12 nights or more, and bookings can be made for stays of 2-3 months. The price is inclusive of all utility charges and taxes, with no surprise extras. All bedding, sheets, and towels are provided, with checkout cleaning and laundry also included. Should you wish to do laundry during your stay, there is a washing machine in the apartment. This flat is managed by a professional support team who consistently provide outstanding customer care. The multilingual team speak English, Italian, French, Portuguese and Spanish, to answer all your questions and needs. Washing machine modern type offered in the kitchen area; dryer is not necessary- as we offer drying racks- and heating system offers a quick and eco way to dry laundry. We have a housekeeping and maintenance team to ensure that your flat will be spotlessly clean upon arrival. Our housekeeping service is always eco-friendly, using only environmentally-safe cleaning products. We welcome children, under adult supervision. For your convenience we will meet you at the apartment on arrival so you don’t have to go to an office to collect keys. We will provide you with 2 sets of keys and all the information you will need for your stay. One of our favourite one bedroom flats. Great feel due to ample space and furnishings, plus a roof terrace. Clean and comfortable Amazing cafes, shops and restaurants, all on your doorstep, and transport to everywhere, even Eurostar to get to Paris! A super-spacious flat, an inspiring space, with a great roof terrace, where there's covered area and open area. 3 WIFI connections in the building for business travelers. NO NEED to go to an office to pick up apartment keys. Our friendly guest manager will be waiting for you at the apartment. The kitchen is fully furnished and stocked with utensils and appliances for your cooking convenience. Playstation 3 PS3 and games provided and 2 controllers. Outdoor terrace: 2 areas, one covered, other one open air, with seating, sunlounger, and also a hammock! Lovely apartment fully equipped kitchen and tech, WIFI, even playstation and Blu-Ray player; with wonderful responsive host in superb location with supermarkets, cafes and restaurants, safe and trendy too with public transport to go everywhere. Superb apartment in lovely location! Great apartment fully equipped and well furnished and carefully decorated. We were able to even cook at home, and use the home entertainment and Playstation and fast WIFI. The location has many shops and cafes and transport to everywhere around. Paulo was a great host from the get-go. The apartment is ideally located, it's is clean and spacious. He even left a mobile phone for guests to use which was very helpful when moving around the city. We recommend anyone to stay here, thanks again for a great stay. Paulo's flat was really nice, very light and spotless. It's located in the best area of Angel, just around the corner from many lovely restaurants. The communication with Paulo was brilliant too, super quick and really friendly. My husband and I lived in this flat for three months for my grad school program. We found it to be the perfect base for our adventures. The location truly can't be beat - we still haven't managed to visit every restaurant and cafe nearby that we'd like to. Paulo and his team were great to work with and were very responsive to anything we asked about. My favorite thing about this flat is how much like home it felt. We are very sad to leave! Angel and Highbury and Islington underground stations are on the same street as the apartment. St.Pancras station and its Eurostar terminal to Paris and Brussels is less than a 20-minute walk away. Many buses into the centre and other parts of London can be found literally on your doorstep, and the West End can be reached in 15 minutes. There's over 15 supermarkets to choose from right here- including Planet Organic and GF and vegan options. Also cafes and restaurants, as well as convenience stores - such as one 24/7 right next door! Famous for its nightlife, buzzing Angel offers an impressive choice of entertainment, from bars and restaurants, to renowned theatres such as the Almeida and Sadler’s Well Dance Theatre. Several live music venues are also close by, the Union Chapel, O2 Academy Islington and The Garage to mention some. And right on Upper Street: “Union Chapel is one of the most beautiful settings to enjoy live music in London and has a totally unique atmosphere” said Tim Arthur, editor-in-chief of Time Out London. The Grade-II listed church in Compton Street, Islington, beat competition from Brixton Academy and the Royal Albert Hall to take the top spot in Time Out magazine’s poll. Other well-known attractions in the area include the Dickens Museum, the London Canal Museum, Camden Passage Antiques Market, Chapel Market, Columbia Road Flower Market, Brick Lane, Broadway Market, Spitalfields and Petticoat Lane. The Emirates football stadium is within walking distance, or a quick bus ride away. The area is family friendly with attractions like the Geffrye Museum and its splendid Kids’ Zone and the V&A Museum of Childhood. There is an abundance of parks and outdoor spaces such as Highbury Fields, London Fields, Clissold Park and De Beauvoir Square. There is a wide array of child friendly cafes both on Upper Street and in surrounding areas. o	Easy walk to Oxford Street and Regents Street and Regents Park. o	Kings Cross St Pancras Station (8 mins walk). o	Near to Regent Park (10 mins). You will also get for FREE: - early check-in and late checkout - baby crib - extra guest bed and beddings - checkout cleaning included - all bills and taxes included - **The apartment now comes with a splendid NESPRESSO coffee machine** The prices for special bank holidays/national holidays vary, and there are also special promotions on occasions.